Warm up exercises are an essential part of your pre-sport regime. As all experienced athletes know, failure to stretch and limber up prior to activity is a major cause of sport injury. Use Peeled Orange Pre Sport massage oil before strenuous sporting activity, and allow the deeply penetrating vapours to ease, and to loosen and relax those stiff joints and muscles. 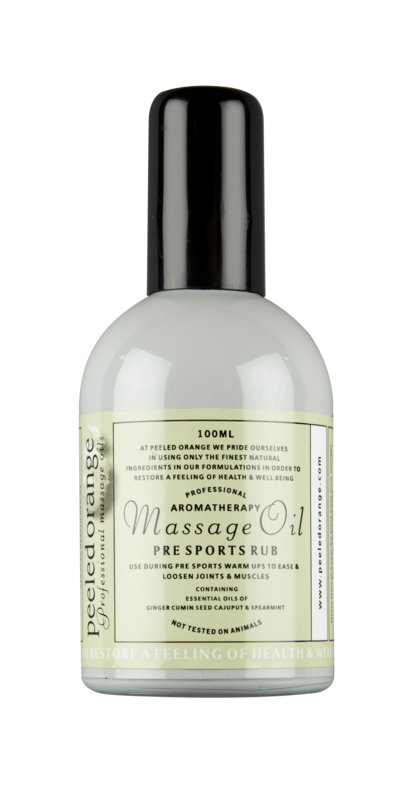 Peeled Orange Pre Sport massage oil contains essential oils of Ginger, Cajuput, Cumin Seed and Spearmint. This deeply penetrating balm will gently but powerfully ease and relax tense muscles and joints. Use Peeled Orange Pre Sport massage oil sparingly where required, or better still, seek the assistance of a qualified and registered Masseur, Aromatherapist, or sport injury therapist. Used to great effect by aromatherapists on sportsmen and women, Cumin Seed is a deeply warming and penetrating oil. Being a rubefacient oil, it is able to stimulate and revive stiff tired joints prior to exercise and it encourages the naturally functioning mechanics of the body to work on and with itself. A truly holistic approach. Cajuput (also known as cajeput) is known to complement the respiratory function, perhaps the most essential aspect of any sporting activity. Cajuput clears the mind and gives focus and clarity. Use Peeled Orange Pre Sports Rub to refresh and revive before activity. Pure essential oil of Spearmint is renowned by practitioners for its abilities to combat physical and mental fatigue. Its deeply penetrating vapors act as an awesome muscular relaxant, allowing tense joints, muscles and tendons to release, gently easing any stiffness and tension.